The beauty of novels is the ability to write with great freedom that allows the reader to create a world with their imagination. Adapting a book for screen has its own set of challenges but adapting a book for the stage can be mightily ambitious. The world transcribed by an author can be vast and full, something that cannot always be conveyed on the stage. 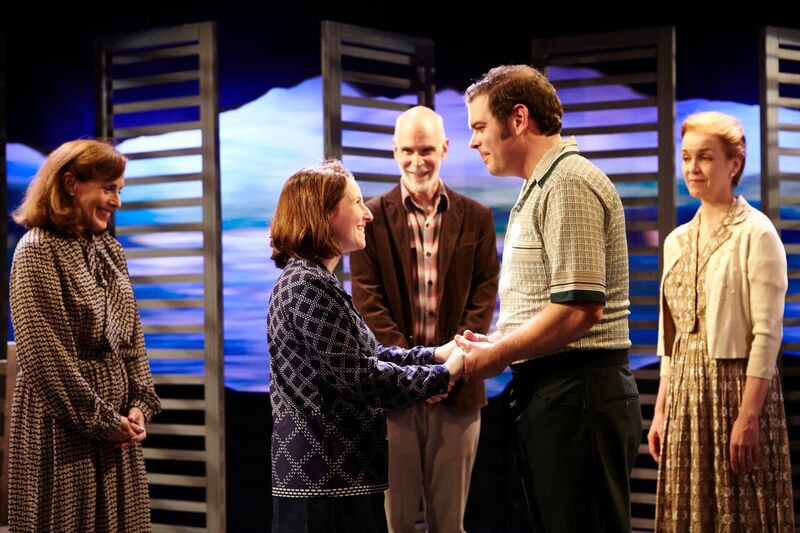 In Jake Lipman's adaptation of Elinor Lipman's "The Inn at Lake Devine", the story spans decades and locales that does nothing but struggle on stage. The play is not about frequent transitions and the pantomiming of food items as it made you believe. 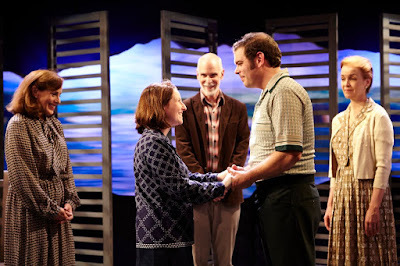 The Inn at Lake Devine is a play about finding humanity in everyone and the anti-semitic world following World War II. The story follows Natalie Marx, a young Jewish girl who's eyes are opened to the unkind nature of people when she discovers a hotel in Vermont will not welcome Jews. Chronicling a span of over ten years, locations from New England and beyond, and a cast of characters, some seen and some only referenced, The Inn at Lake Devine is an overstuffed stage play. The reason may simply be Jake Lipman's fondness to the material and honoring the author's text. To say there is excess material is an understatement. When adapting for the stage, it's necessary to pick and choose. Many moments, characters, and scenes could be condensed or eliminated all together. Theatrically, the prime plot is about Natalie and her coming to terms with the anti-semitic Mrs. Berry and her hope of teaching this woman that her actions may not be morally right. It's quite possible the novel is much grander than that but on stage, that is the interesting narrative. With that in mind, there certainly are many events that directly or indirectly affect this story but with the snapshot structure of the script, the constant change of place and focus calls the intent into question. For example, the information of Natalie's sister Pamela marrying a non Jewish man is important to the arc of the story but it can simply be a few lines rather than two sequential scenes. This happens quite often. With what feels like half the play spent shifting scenes, moments of fluff hurt the overall momentum. The vocal company was beautiful to listen to but there were far too many musical moments. They did not have an impact on the story as a whole. When it came to drafting well-rounded characters, the adaptation process seemed to get the best of Lipman. There's a rich ability to expand on story in a novel but in theater there isn't that freedom. When it came to Natalie, her arc was very one-dimensional. Her obsession with not understanding why the world was what it was was the focal point in nearly every scene. There was very little beyond that, even when she developed new or intimate relationships. When it came to the supporting players, there were shades of full character journeys but with the long passage of time, important checkpoints were missing causing leaps, primarily with the Berry boys. We never truly got to witness them come to terms with the knowledge of their mother. On the opposite side of the spectrum, Natalie’s parents Audrey and Eddie only wanted to shield Natalie from any harm, guiding her away from hurt. At first they seemed understanding to Natalie’s game but when they switched, primarily Audrey, it was a sharp shift of character. Theater forces audiences to suspend their disbelief. But there’s only so much disbelief you can have when it comes to this casting. Until exploring the script, it was unclear as to why much of the company was presumably at least ten years older than the final age of the character. This may partially be due to the desire of using the memory play device. Sadly, the piece never really established itself as much aside from one or two tiny moments that were swiftly swept away. But regardless of the intent, it was hard to believe the company reading as teenage to twenty-something. Though Maria Maloney as Robin Fife made a strong case of believability. Maloney’s conviction and youthfulness transformed her in a way her costars could not. Jennifer Dorr White as the unyielding Ingrid Berry played the part with ease. She had the aura of a Disney villainess. White was able to bring a multifaceted performance because you could see that despite her conscious not being morally true, her heart was present. At the core, Natalie wants to educate and bring awareness to Mrs. Berry. Jake Lipman lacked the strength to do so as Natalie. There was little fervor in Lipman's character as the same tactics were played throughout. Andrew Spieker as the love interest Kris found moments of truth but didn’t quite have the spark with Natalie. The battle between family and love seemed to play a very little role. The way a play is staged can be the make or break of the fluidity of the piece. Using a three-quarter thrust set up allowed the length of Theatre 54 to be utilized. And with a cast of fifteen, that was essential. The set crafted by scenic designer Tyler M. Perry was absolutely stunning and picturesque with clean lines. Perry kept it simple by using only four chairs, a kitchen table, and two benches. All while fifteen actors, with moments where more than half were on stage at once, had to navigate through all the while maintaining viable sight lines. Director Kimberly Faith Hickman did all she could with the hand she was dealt. Rather than clutter up the stage, Hickman utilized pantomime as prescribed from the script. But with food appearing so often, it was comical to watch. To allow variety and continuity of the multiple locations, Hickman had to stage many of her moments in the corners, causing backs for some part of the audience. Even in prime seats, it was inevitable you would miss important moments. In any other space, Perry’s furniture would have worked but for this play, they were just obtrusive. You almost have to ponder what even less would look like for the storytelling. With scenic shifts occurring more often than not, the score by Philip Rothman was ever present. While it sounded beautiful, it did not quite line up with the action of the transitions. They were timed out in a manner that was detrimental. Sometimes the company didn’t finish in time and were left in silence. Other times it would linger on when the shift was over and the scene desperately wanted to begin. When it came to being the accompaniment for the singers, you could tell that it didn’t quite come naturally, forcing the quintet to wait for the music rather than the music follow them. The Inn at Lake Devine is certainly a fascinating story and a story that resonates. But as a stage adaptation, it didn’t quite land. Running at nearly two and a half hours, not only does it need to be tighter, it needs to be streamlined and reimagined.